Queendomino is a family board game for two-to-four players that takes around 30-40 minutes to play. It is essentially a slightly more complex version of Kingdomino, sharing the faux-medieval theme and dominoes-inspired set collection game play – but with a few twists that raise it to being more like ages 10+. 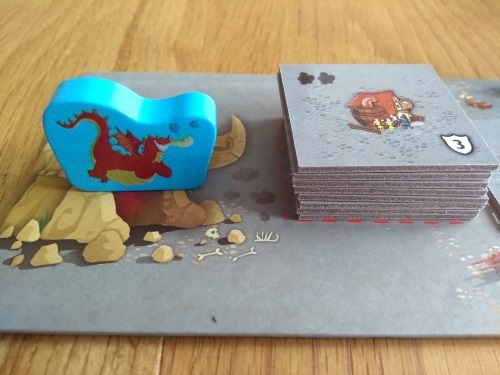 The artwork is also very similar to its award-winning predecessor, whilst again you’ll get 48 tiles, four little cardboard castles and eight wooden kings. 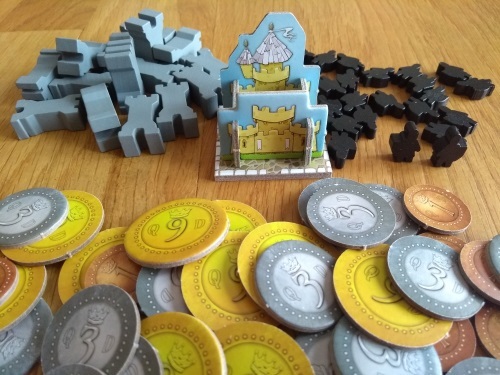 But this time they’re joined by 32 town tiles and a town board you buy them from; a bunch of cardboard coins; wooden towers (15) and knights (22); a handy colour score pad, plus cute wooden queen and dragon pieces. The box is quite a bit bigger than the original, but the overall production quality throughout is again very high – making it very good value for the price tag, which is around £20. In fact, it makes a mockery of many other games in its price bracket. The basic rules of Queendomino are identical to those in Kingdomino (including basic scoring and number of rounds), so I won’t go into depth on them here (please click on the link above to my review of that game if you need to). Essentially you still do the same basic phases: add your new domino to your kingdom, then choose a new domino by placing your queen on it. What’s new are three optional phases in between them: use knights, construct a building and bribe the dragon (done in that order). Knights can be placed on the tile you just added (so you can use two on your turn if you have them, one on each side of your new tile) and earn money – one coin per square in its area. Money is used to construct a building (one per turn, built on the only new terrain type, towns), which then give various benefits. Finally, if you don’t currently have the queen in your territory, you may bribe the dragon to remove a building from those currently available (there are six to choose from). Town spaces appear on 20 of the 96 squares that make up the 48 dominoes in Queendomino; but they’re basically dead tiles until you build on them. Many buildings give you points or new ways to score points (including crowns, as with basic tiles); others give you bonuses when you use your knights to get taxes; plus, some also give you knights and/or towers. The first player to claim a tower also takes the queen into their kingdom – but don’t get used to her being around. As soon as another player has an equal (or higher) number of towers, the queen will move to their kingdom. The queen gives you a one-coin discount when constructing buildings and counts as an extra crown in your largest area if you have her at the end of the game. On the downside, you can’t bribe the dragon. The writer: The addition of the 20 town tile spaces reduces your chance to create large scoring areas, but many buildings let you score for having lots of small areas in a colour, rather than big ones. This reverse scoring adds an interesting extra tactical level that was needed and works well. However, it means towns can’t be ignored: it’s not as if you can choose a completely different way to try and win the game. However, as a gateway game, it now comes with a few light euro game elements that will be a good way to take your non-gamer friends to the next level. The thinker: I’m still happy to play Kingdomino as a light filler, as it has surprisingly interesting decisions in a short time span. But the extra play time, setup time and fiddliness introduced with Queendomino seem to muddy the waters rather than expand them clearly. More isn’t always a good thing and for every new potentially strategic element here another random one seems to have been added that balances it out, meaning it doesn’t feel any more controllable. I had high hopes, but surprisingly I think I still prefer the original. The trasher: The dragon adds a nice tactical element to the interactive part of this series, but can only be utilised by one player once per turn – so is better with less players (otherwise you may rarely get to use it). Its similar for scrapping over most towers, or most knights – if a couple of you go for it, it’s likely to simply benefit the other players as you’re watering down your own benefits and clearing undesirable tiles for your opponents. That said, the core element of choosing turn order still works well and its fun to put both games together to make bigger grids. 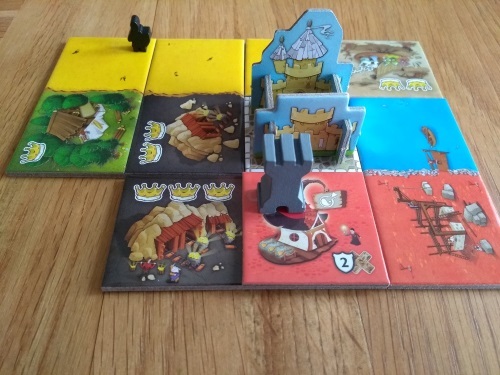 The dabbler: I still love Kingdomino and was looking forward to this – especially after seeing the cute new pieces (some of the things the sheep are getting up to on the new tiles is hilarious). But unfortunately I was disappointed: the game just seems to add complexity for complexity’s sake without adding any extra fun. You definitely wouldn’t want to play with younger children – especially as the little wooden knights are ridiculously small (and, frankly, the wooden towers are too big – you can barely see what is on other players’ tiles if they have one on – and if its two or three, forget it!). The addition of score sheets was very welcome though. 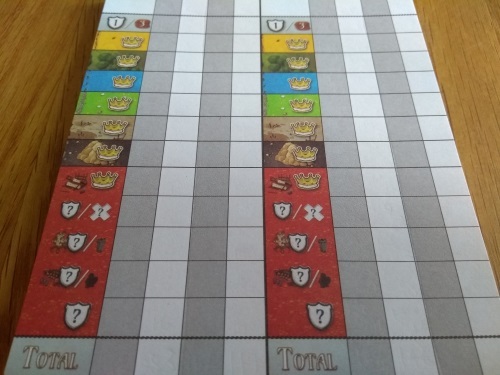 It may seem as if I’ve given Queendomino a rough ride, so I feel the need to point out here that in the wider community the jury is definitely out on which game is ‘better’ – in fact, at the time of writing, both games ranked a very impressive 7.4 on Board Game Geek. Those who love it appreciate the extra play time, see it as having deeper planning than the original, while adding the elements they thought were lacking. Those who don’t (like me), amusingly, simply say the opposite: the extra play time feels unnecessary, while the extra bits are over-complicated and weaken the game’s fantastic core. Is it deeper – or overblown? I’m afraid that’s simply a matter of opinion. The ability to combine Queendomino with the original is great if you like both games and has been very well conceived. I do enjoy making a 7×7 grid (rather than 5×5) when playing the original two-player and having both games means you can do this all the way up to four players. Also, this waters down the town tiles sufficiently to make them have a little less impact, bringing the original scoring methods more to the fore. When combining both games, in fact, quite a lot of things seem better balanced. When playing just Queendomino, the town tiles seem to have been given a bit too much weight in terms of the numbering – but this makes sense when playing the bigger game: town tiles are rarer, so feel more desirable. Unfortunately though, if playing two-player, this combining of the games is only an option if you go for a player-created variant that makes 10×10 grids – quite the undertaking! I was happy to see Kingdomino win the Spiel de Jahres award and over a year on from my review of the game I’m still very much enjoying it. I looked forward to Queendomino and was still excited about it as I was getting it out of the box. But I won’t be keeping it in my collection. I am definitely in the “it’s over-complicated” camp and, with its extended setup and play time, I have many family weight light euro games I’d rather reach for (both my recently reviewed Thurn and Taxis and Maori spring to mind). But this shouldn’t be seen as me giving Queendomino a ‘bad’ review. It’s high average ratings and scores of fans are genuine, while the production quality is high. The game is well designed and also works/flows beautifully; it simply isn’t for me. If you love the original, I suggest you try this one out – and if you thought the original was simply too light, again, this is worth a look. Just be aware of its Marmite nature going in.